I just wanted to post a quick blurb here to point out that the url for my blog is no longer using "blogspot.com." It is still hosted and created on the Blogger platform and any links that end in freemotionquiltingadventures.blogspot.com should still work. I've done a "redirect" so that it all shows up on www.freemotionquiltingadventures.com. It's still quite a mouthful, but a little shorter. If you read the blog in a feed reader or RSS service, you might need to change it. But the blog has been set up this way for the last 3 days, so if you haven't noticed any issues, you're probably good. In other news, I've set up an Etsy shop. 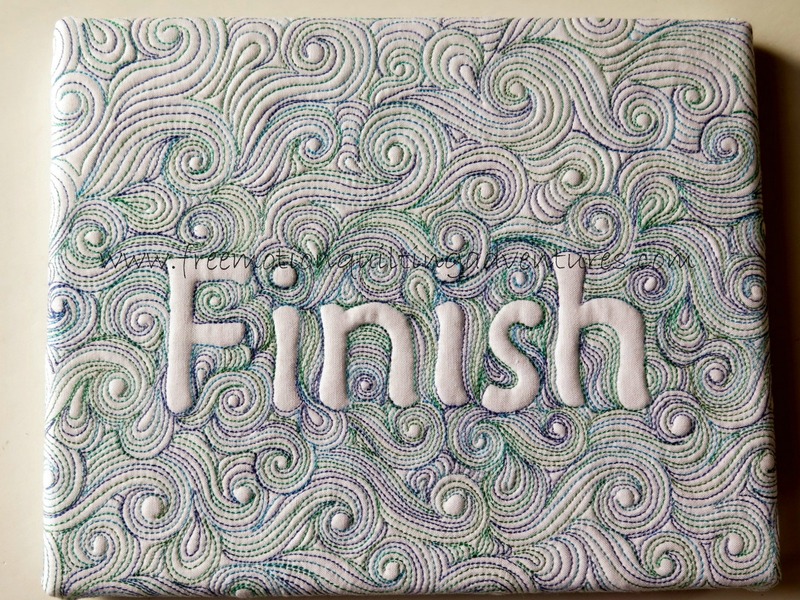 I shared a picture of my "Finish" quilted wall art with a Facebook group that I am in and many of the members were interested in having their own word done up in a similar fashion. I'm totally new to the Etsy thing, but I figure it's another adventure to try! I'm continuing to work on my wholecloth quilt. That silk is slippery! I am having great results with the YLI silk thread too. It's so fine, I have trouble seeing it as I stitch but that makes for great backtracking. The silk/cotton blend of the Robert Kaufman Radiance is beautiful, but shiny as well as slick. I get some great light through my window and I've had to lower the shade a few times to keep from being blinded! On the window ledge is one of those little solar powered flower things. It was a gift from a friend and it just makes me happy to see it in the window while I work at my machine. It also peeks out the window and greets me when I park in the driveway. I hope you are having a wonderful weekend and get some time to free motion quilt. In a my previous post on working with text, I mentioned a few light table alternatives. Today, I'm telling you about them. A light table is actually pretty simple to build. It's just a platform to hold a light with a transparent surface. A web search will turn up several DIY options. Here's a very simple light box tutorial. If you build your own, make sure it's not a fire hazard, yet bright enough for tracing. There are many tutes for making light boxes for preschooler activities right now, so make sure the tute you use is suitable for tracing. I have an old light box that was given to me. The plastic surface is getting a bit yellowed and dim, and it's bulky. I like it though and it works fine. Now there are digital and LED versions available, but they can be spendy. They are nice and slim though. If you have a tablet computer device (iPad, android tablet), You can use a drawing app with a bright white "page" or even a flashlight app to provide light and after you first protect the surface with a piece of glass or Plexiglas, you can use it as your light table. Can you see the Plexiglass over my tablet? My preferred method (until I got my light table) is to take my sewing machine out of it's recessed hole in my sewing table, put a light in the hole and cover it with a sheet of Plexiglas. In fact, I like this method better than the light table when tracing large designs as more of it can lay flat. You can also use a clear acrylic extension table with a light under it for the same purpose. You can pick up some good battery powered lights for this purpose or even a string of LED lights. Then there's the super easy to store version: Using a window! Tape your design to the window with painter's tape and then tape the fabric over and trace away. Granted, it's a bit awkward if the neighbors can see you. But you can't beat the price. You might also gather from this post that a sheet of Plexiglas is a handy tool for a quilter. I'll save that for another post. Yes, I'm getting to be a tease with my posts. But it keeps me posting more regularly and keeps the posts a little more concise. In December, I made a gift for a friend. I shared the finished project with you on A Friend Loves at All Times, but I never shared the video with you. I think you'll notice an improvement in video quality as I shot it with my new camera (a Canon Powershot G16). You'll also be pleased to know that my hubby has fixed my sewing chair and there will soon be less creaking of my chair as I wiggle around while shooting my videos. Below is a shot of the whole design, but since the lighting was straight-on, it looks very flat. I can't wait to do some more videos with my new camera. I hope you like them. I get so much more done when I know you fabulous folk are watching. Hmmm...does that sound creepy? Exhibitionist-y? I dunno. 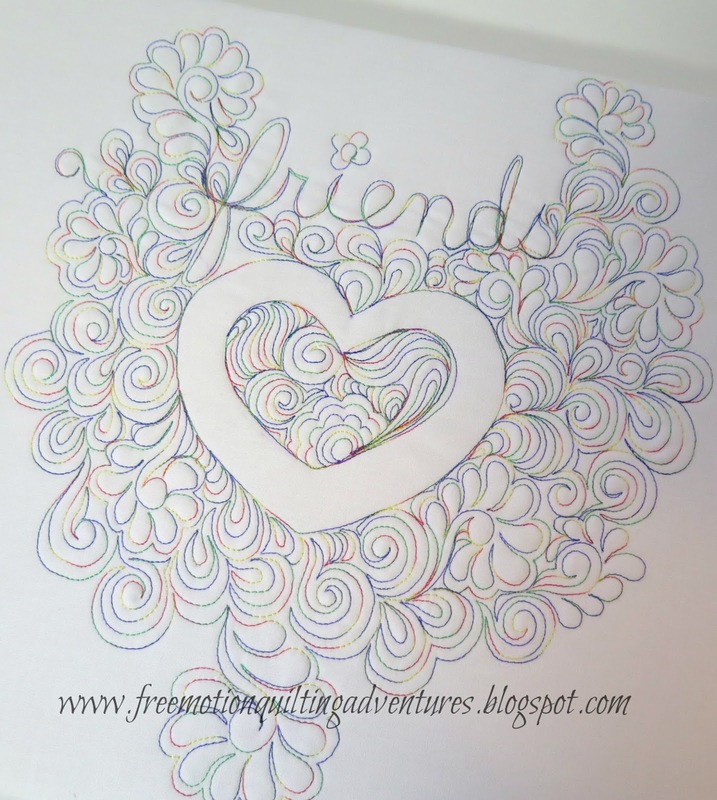 But I know it's fun to share my free motion quilting adventures! Here's what I'm working on this weekend. I actually had hoped to make it and finish it in time to submit it to the Mid Atlantic Quilt Festival. But with all the sickness we've had here, I didn't finish drawing the design until yesterday. Since the entry deadline is Tuesday, I don't see any way that it will be ready. In honor of my word of the year, Finish, I am working hard on it anyway. I marked the silk/cotton blend (Kauffman's Radiance) last night. I spray-basted it this morning after church and started quilting with YLI silk on top and Glide in the bobbin. Pretty good progress, don't you think? Back in late October, reader Becki sent me an email letting me know she had taken a free motion quilting class from Patsy Thompson and Patsy had recommended my blog and videos to the class. After letting out a squeal of glee, I emailed Patsy to thank her and it has sparked an email correspondence that has been so encouraging to me. She and I both are looking for ways for more quilters to do free motion ruler work. She has access to more machines than I do and after some back and forth discussion about the 3rd party ruler feet that have lately come onto the market claiming to fit nearly all sewing machines, she decided to try the Janome Ruler Foot on some of the machines we hadn't tried yet. 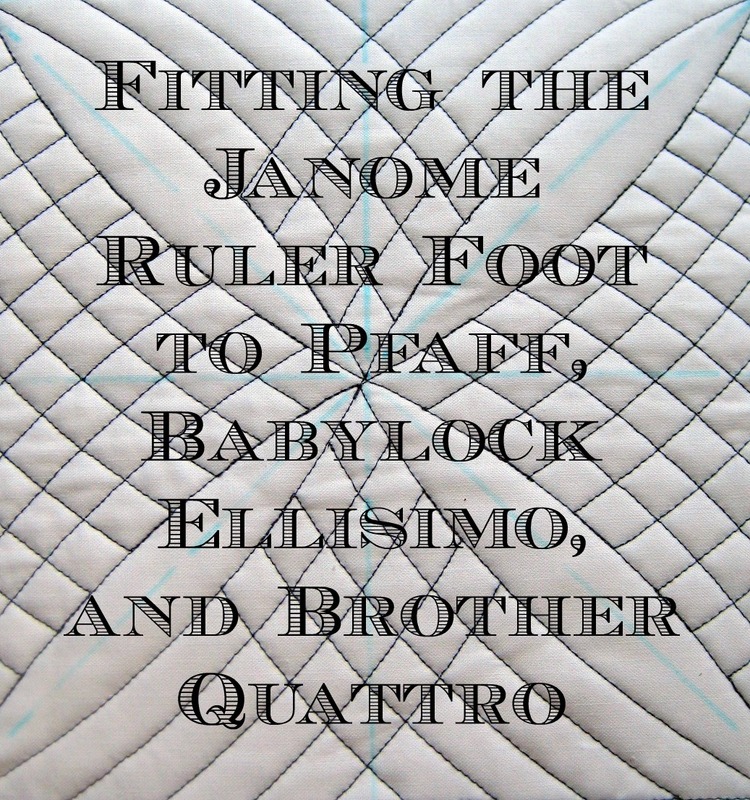 Patsy has just done a very clear and fabulous video on her blog showing how she's made this Janome foot work on several Pfaffs, Babylock Ellisimo, and the Brother Quattro. So go check it out! If you don't have any of these machines, it will still give you some ideas to see if you want to experiment with your machine. I have a Q & A post coming up for you on a new 3rd party ruler foot maker next week. But in the meantime, we're getting closer and closer to getting everybody into free motion quilting with rulers and templates. I am sick--again. So I am so glad to share Patsy's post with you and go back to bed! I think I'm going to start spraying the kids down with Lysol before they come in from school. At least this time no one's stomach was involved. 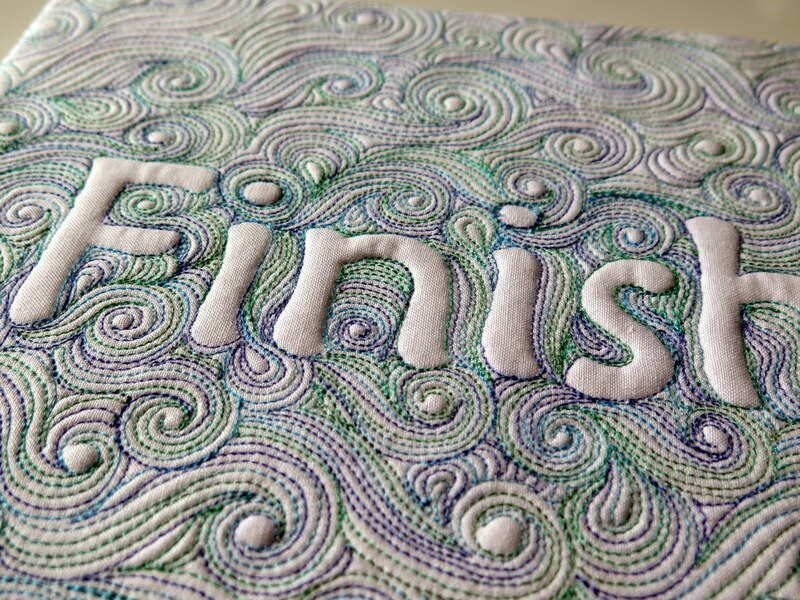 Saturday I shared my latest quilting finish: My word of the year, "Finish". I played around with my new camera to try to get better pics. Below, the light is fairly straight on (on my design wall opposite the window). It's hard to even tell that this is quilted in these pictures! It could just be a drawing. 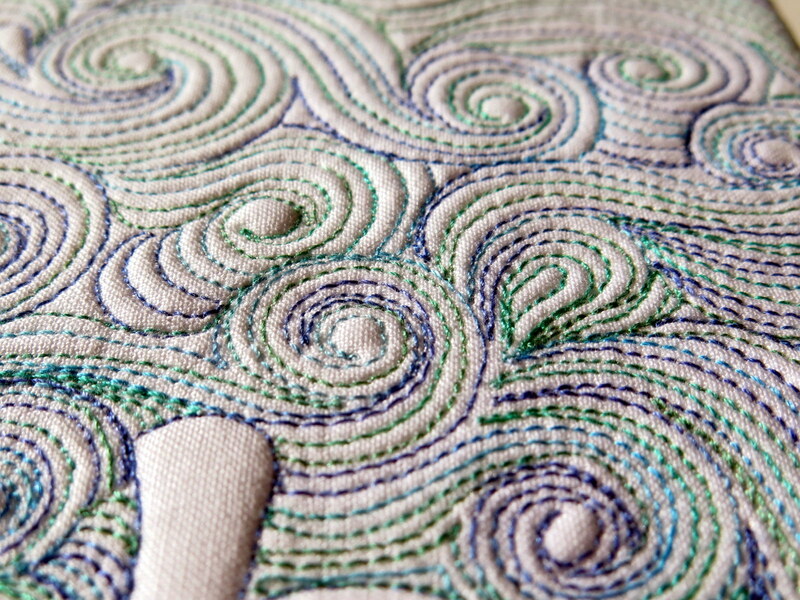 The number one tip for showing off the dimension and texture of your quilting is Side Lighting! Lighting is so very important for good pictures, but with quilting, it takes side-lighting to capture the texture of the quilting. In this picture, I've turned the design wall perpendicular to the window. (My design wall is batting covered 1 inch thick foam insulation board, and it's not attached to the wall.) What a difference it makes! Perpendicular is a bit overkill as evidenced by the bright glow along the right side, but a slight rotation of the design wall will fix that. Second, use a tripod. The tiniest movement of the camera when you press the shutter button will keep the focus from being as sharp as possible. That blur will flatten the appearance of the texture. Bonus tip: If you've ever entered a quilt into a show, you already know to keep the camera exactly centered and square on the center of the quilt. The tripod certainly helps with this. Without it being centered, the quilt's shape is distorted into more of a parallelogram. You can see my tripod was slightly off when taking the above pictures. I've mentioned before that my word for the year is "Finish". 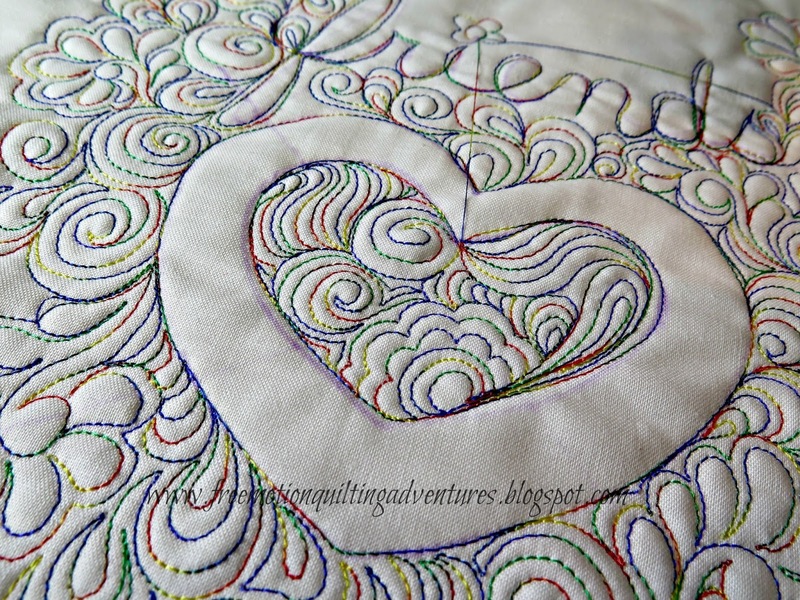 I gave a tiny peek into this project in my Transferring Designs to Fabric post. It would not bode well for me this year if I couldn't finish my "Finish"! It's all done now, stapled onto the frame and ready to hang in my studio. I am so happy to have it quilted up to put it on my wall. It's ridiculously densely quilted. The canvas I stretched it over is just 8 by10 inches. I shared it with a few friends on Instagram and Facebook in its unfinished form and we had a good giggle over the irony of the unfinished piece. Speaking of Instagram, I've now got a smart phone and am trying to make better use of that service. I had to have my baby sister walk me through a few points of using it. (She's a mere 21 and her iPhone is nearly a permanent appendage.) If you are on Instagram, you can find me as "amys_fmq_adventures". 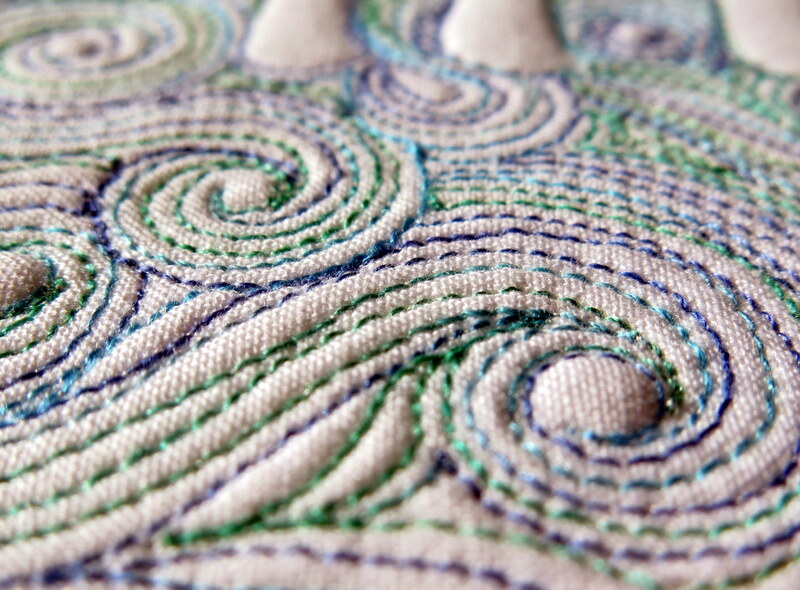 I'd love to follow more quilty folk there! I used a white Kona cotton for the front and backing of this piece. I had done another similar piece in december and shared that I only used a front piece of fabric and batting, no backing. I'm back to using the standard 3 layers of top, batt, and backing. 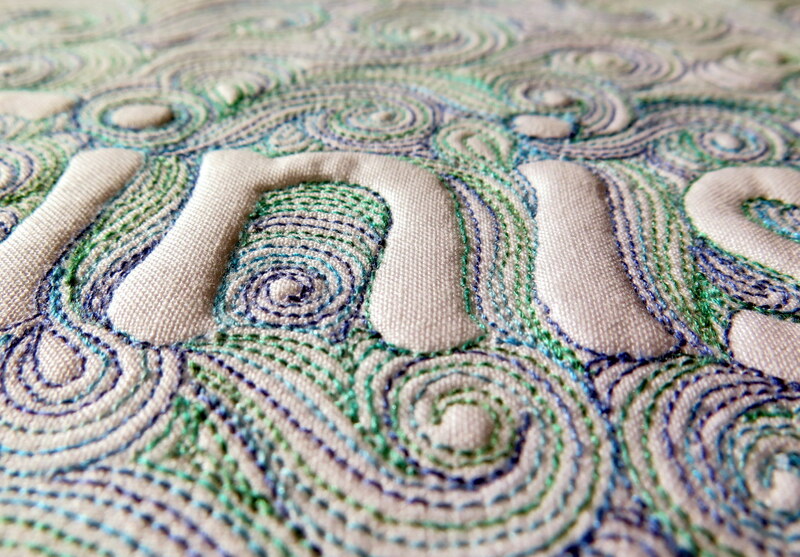 I had forgotten to mark one of the dots above an 'i' and quilted right over where it should have been. I could have stalled out right there, but I ripped out the area and stitched the dot a few times. It was too small an area to tie off and bury the thread ends unless I ripped out a large section. I've decided it's a symbolic happening. A reminder of when I need to push through the perfectionism that makes me stall out on so many projects and just finish. Not that I'm embracing poor workmanship or sloppy technique, but keeping it in a workable perspective. These swirls make me happy! The thread is a Sulky Blendable. It's a pretty variagated cotton thread that's been in my stash a long time. So here's to many more finishes this year. Some of my finishes are quilting projects, some are more personal, but all need to get done this year. I hope we will inspire one another other to do more free motion quilting and get more finishes under our belts. 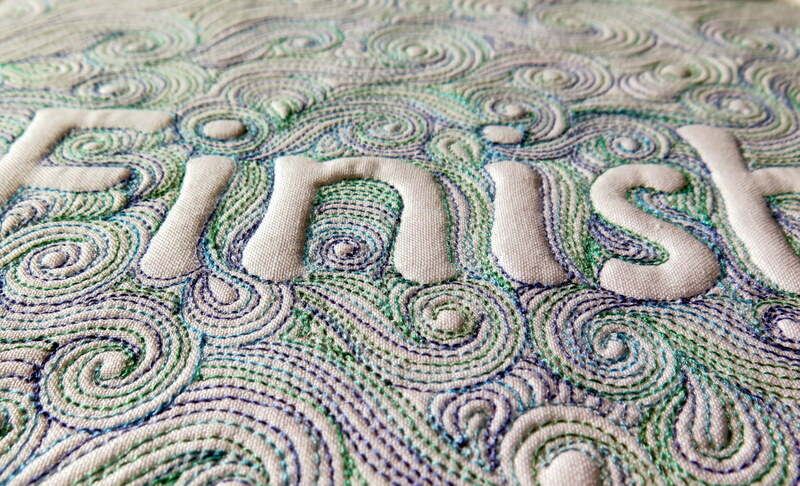 A few months ago, I began a series on working with text using your computer and using that resulting design in quilting. I promised a tutorial on transferring those designs to your fabric and here it is. First there's a step I should have pointed out in Working with Text, Part One. When tweaking your text in Word, choose a line thickness that will be bold enough to see. Not too thick, but not too thin, but just right. I prefer 1-1/2 pt to 2-1/4 pt lines. Sometimes this can vary with your printer settings. 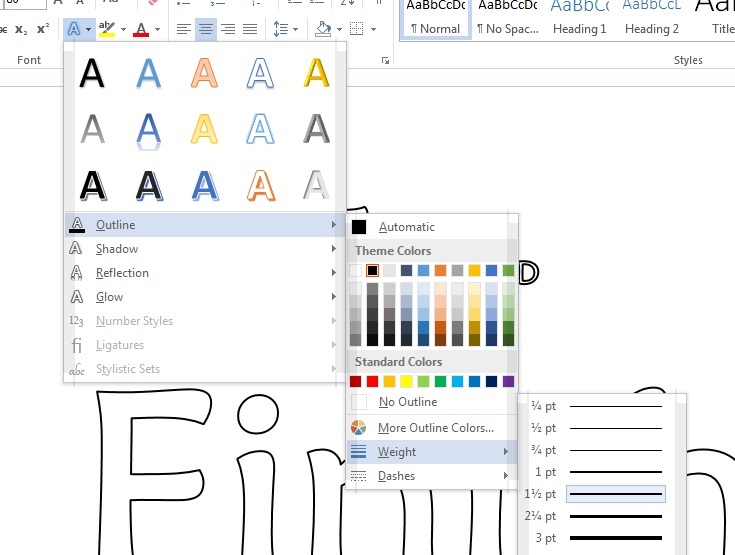 (By the way, Part 2 of working with text shows how you can enlarge your design using Paint. At some point, I'll do a third part on using a different program for a clearer enlargement. 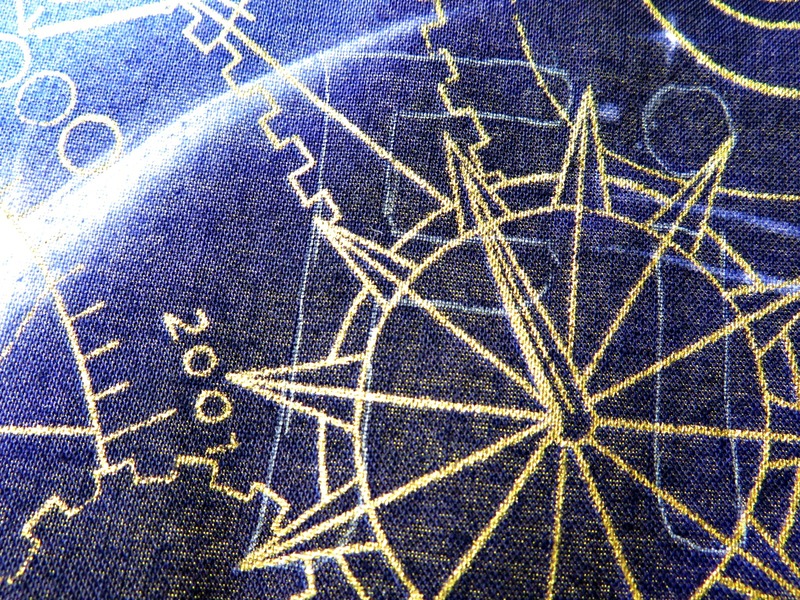 With a good print from your computer, it is super easy to trace the design onto light colored fabric. I'm using Kona cotton for the white fabric shown below, which is a fairly substantial fabric. First thing is to mark registration lines on your project. 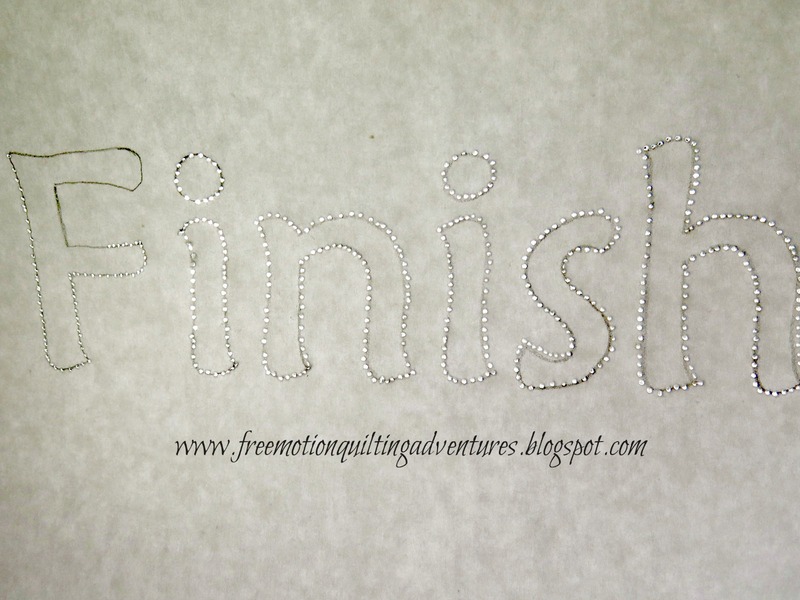 For this project, I'm quilting my word of the year, "Finish" onto a canvas covered frame. I traced around the frame with my air eraseable pen. I'll have to work fast with this. Then some markings to show the center of the fabric and a line to rest my words on. Placing the word on the project can be as accurate as you want. It just requires more measurements and marking. 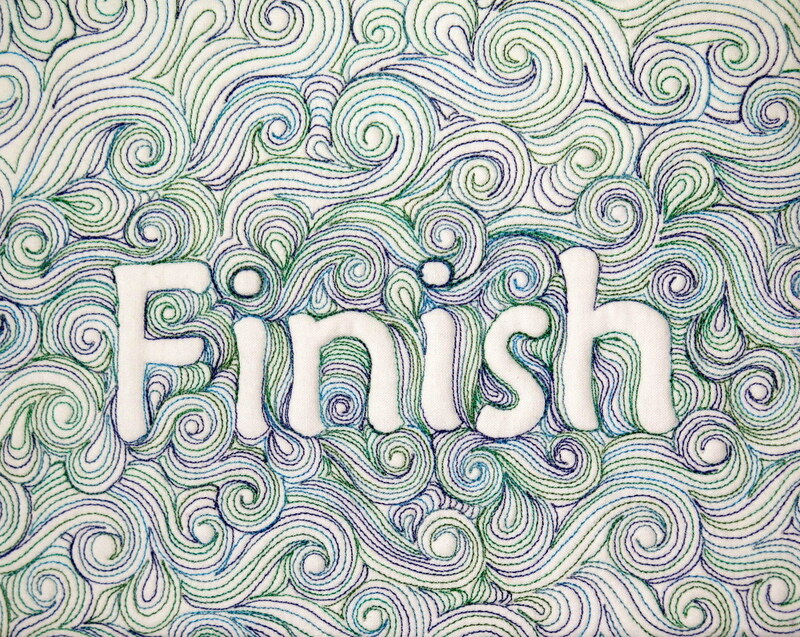 The text above 'finish' has two purposes. 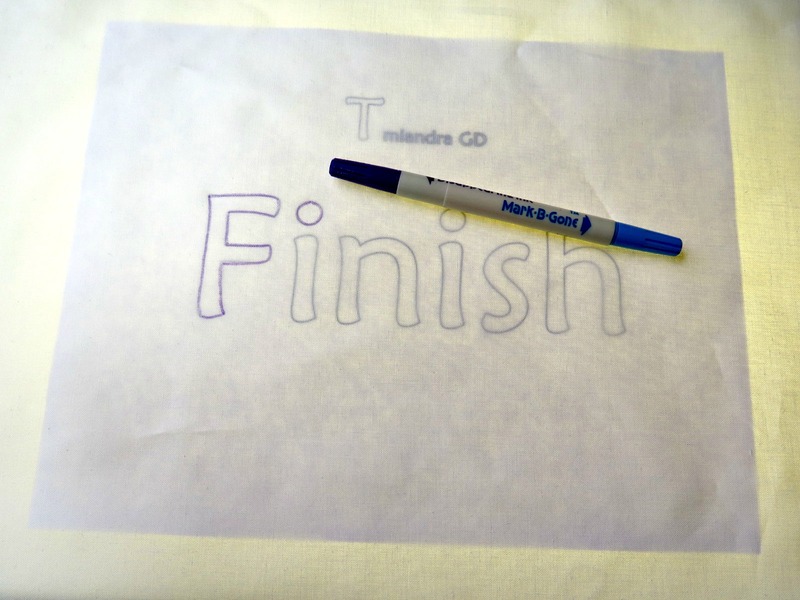 The T is a place holder and helped me to move the word 'finish' lower on the page. Miandra GD is the font I used. Since I'm marking the word onto white fabric, it's pretty easy to lay the fabric down and trace with my marking pen. I use painter's tape to secure the design and fabric to the table. Don't want either one to slip. But what if you're not using white fabric? Then you can use a light table to help you trace. A light table can even help you mark dark fabrics! (Alas, I couldn't get it to also photograph well.) 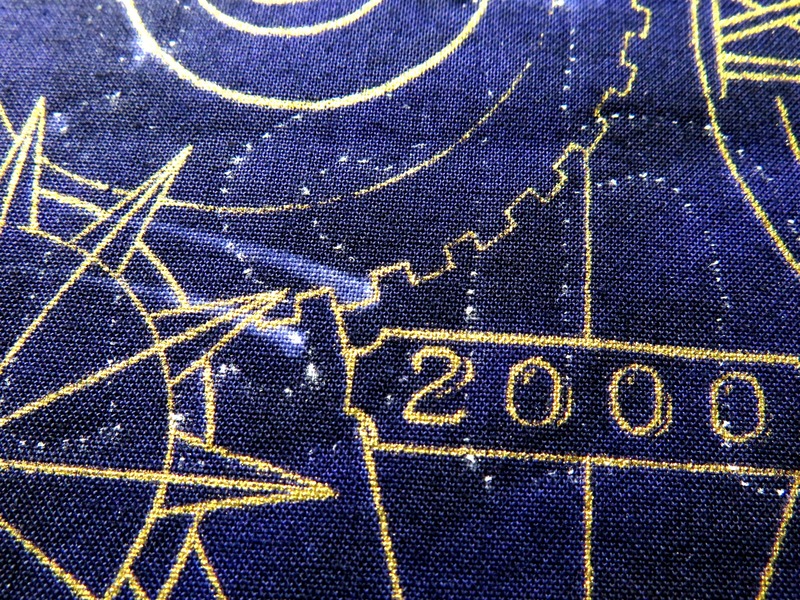 The fabric below was marked on the light table too. Don't have a light table? Don't worry! Follow my blog with a feed reader (Feedly, Blog Lovin', etc. ), by email, or just check back with me often as I've got another post in the works on make-do light tables and alternatives. A fabulous way to mark dark fabrics is with your own freezer paper stencil and chalk. First get your design onto freezer paper (again, I've got some alternatives for this that I'll post soon). For this project I just traced the design by putting the printed page under a single layer of freezer paper. I didn't even need to use the light table. Then I ironed the marked piece to another layer of freezer paper, shiny side to dull side. This causes some distortion as the freezer paper does shrink a bit. A heavy paper or cardstock will work without distortion or the second layer, but the freezer paper allows me to press it to the fabric later. 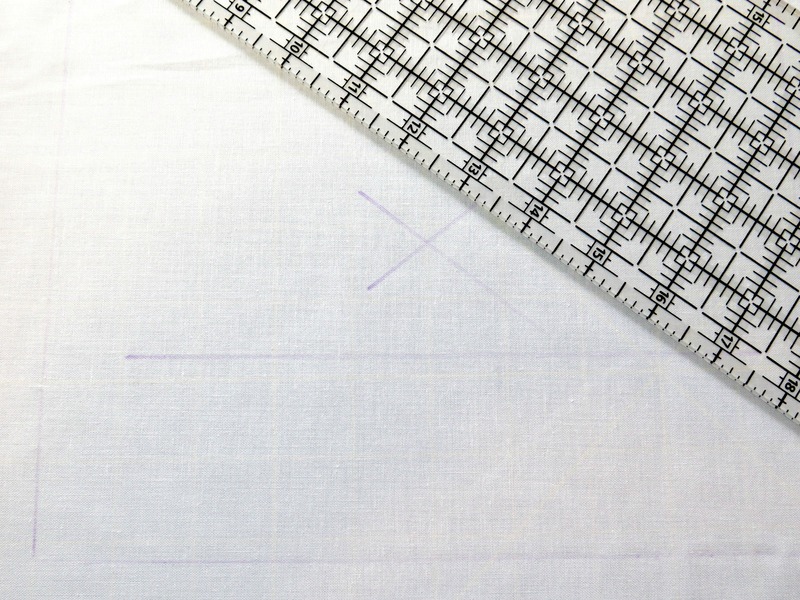 Then poke holes on the drawn line with a seam ripper, awl, stiletto, or large needle. It is better to get bigger holes that aren't too far apart than it is to get tiny holes very close together. Hold the stencil up to the light to see the results of your tedious poking. You'll also see if you've missed spots. 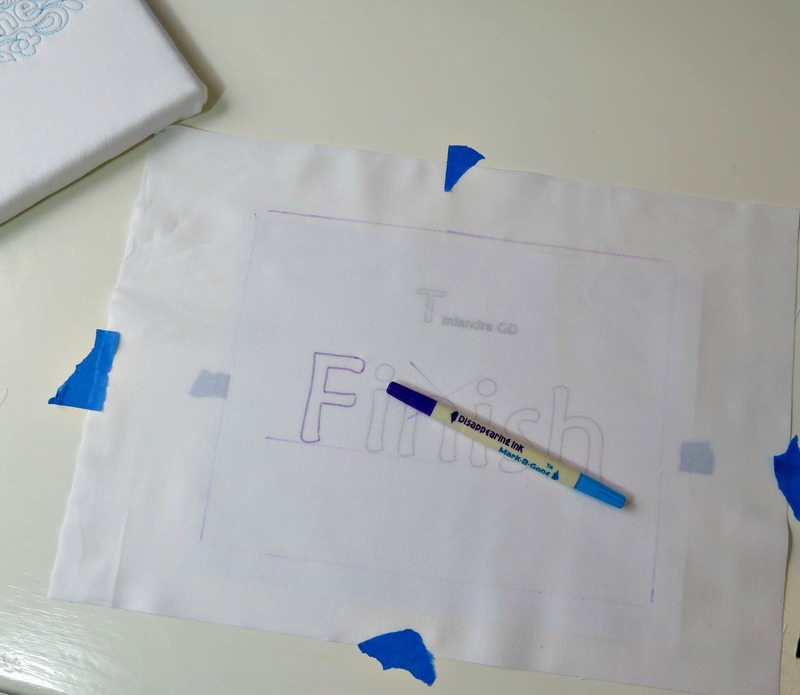 Then secure your stencil to your project. This is where the freezer paper comes in handy as you can iron the shiny side to the fabric. You can reuse it many times too. Then rub pounce powder/chalk pad over the stencil to mark it. 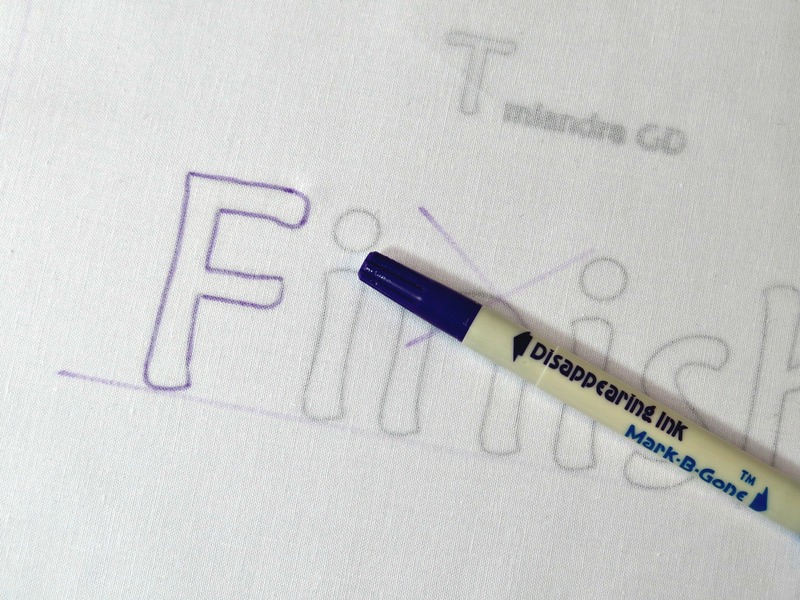 If you've got a light fabric and don't have colored chalk (or don't trust the colored chalk), you can press the tip of a fabric marker through the holes. I rub the pad over the holes a few times and then use the small sponge to rub excess powder into the holes. I use Miracle Chalk Quick Swipe Pad- . It 'erases' with heat. Don't skimp on the chalk. Peel the stencil up slowly and see the marked fabulousness! 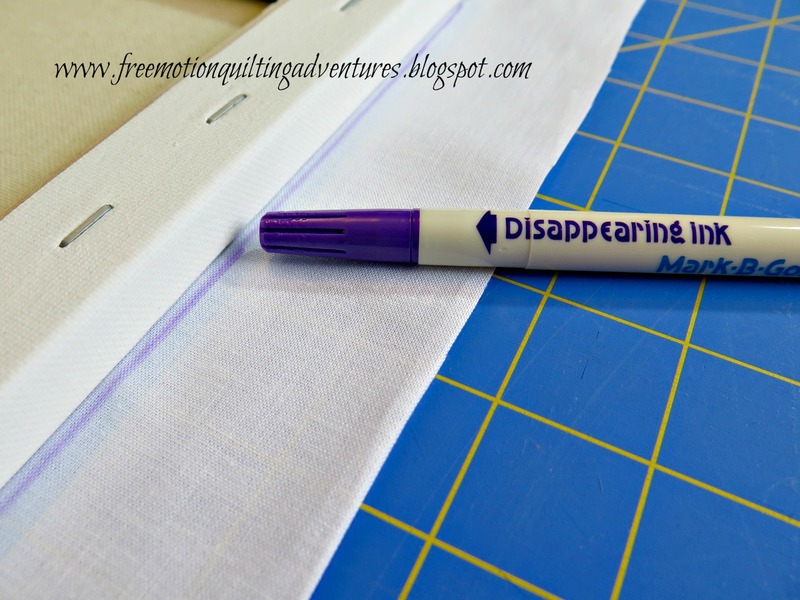 The stencil method is also great for marking a quilt after it's already been layered with batting and backing. 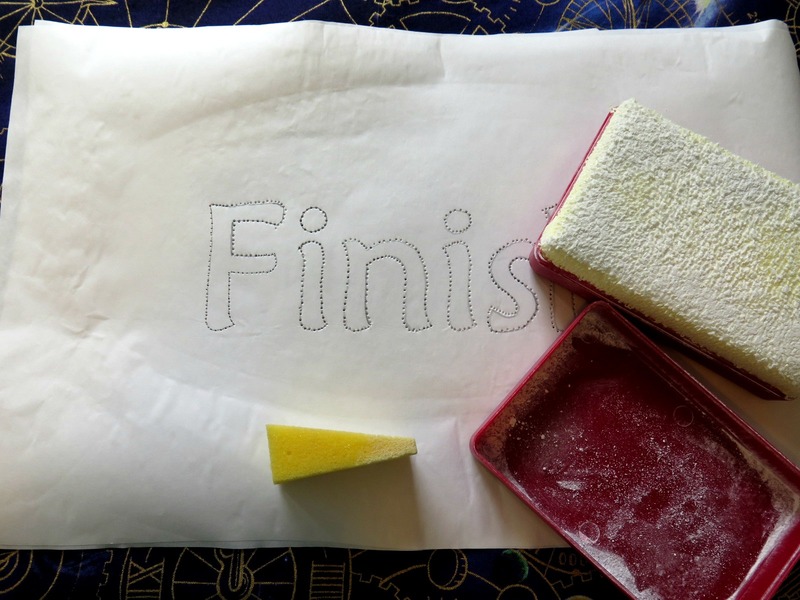 Now, I'm going to go finish my "Finish". Stay warm and safe folks! And if you're in the southern hemisphere, stay cool! Craftsy is running a Blogger Awards contest. Nominate your favorite blogs and you will be entered into a drawing to win one free Craftsy class. For this round, you nominate your favorites, regardless of whether someone else has nominated them already. Only the top 4 blogs in each category will move on to the next level where you can then vote for your favorite. You've got until the Twentieth of January to nominate blogs. Go to the Craftsy Blog for more information. Might I hope that some of you will nominate mine? I am happy to say that my family seems to be over our illness and I can't wait to post some new quilty content! Here's a video review I did of the Janome S5 at the shop I work at, Sew Simple. Not one of my best, since it was taken at night and I had the hold the camera with one hand throughout. I didn't do any fancy free motion quilting on it on video since one handed quilting has limits. I do really like the machine and think it's a great one for someone who wants to move up from a regular sized sewing machine, but doesn't want to go whole hog on a high-end 11 inch throat machine. That knee lift is a hugely useful feature! To clarify, it has 8.25 inches to the right of the needle. Please don't ask me the price since Janome dealers aren't allowed to publish the price for this machine online. Since I work for a dealer, I don't know that I should post it either. I know these kind of policies irritate many customers online, but Janome does not want to 'fix' the price for all the dealers. This also helps get people to go to the dealers closest to them to check out the price. I'm pretty sure most dealers will give the price over the phone. It's to also dissuade buying at the cheapest dealer wherever and then getting any service work (free when under warantee) done by a dealer who didn't get to profit from the sale. It seems I'm getting some new readers here and I am thankful. I am also sorry there hasn't been more quilting content lately. The kids have been taking turns with illnesses. It seems today is my turn and let's just say I am thankful for a couple of kinds of fortitude and the http://www.craftsy.com/apps. I've been in bed whenever I could, watching some of the classes I bought during the last big Craftsy sale on my tablet. Sure helps pass the time since I didn't want to fall asleep while I had 2 kids at home today. I've always heard that big-time bloggers prepare and schedule post in advance. I've always thought it a good idea even though I'm not a big-time blogger. Guess I'll add it to my to-do list! I took my usual calender and cut the pages free so I could see the whole year on it. I'm one of those people who will miss an appointment in the first part of the month because I've failed to turn the page to the new month. I also went to Art Call, an online call for entries for many quilt shows and entered in some potential show dates. I also added in some dates for AQS's Quiltweek shows. Will I manage to finish and submit a quilt for show this year? My husband helped me put up a bulletin board in my studio last night. It's right in front of where I tend to sit at my lap top. I've got my "Finish" notecard up there as a reminder. Since it's the start of the new year when people make resolutions, I'm working on a few things too. But I prefer to set goals. I've made a weekly checklist for some of the things I want to improve. I am not a very confident person, and I read that small successes can help you feel more confident, so I've got that up on a wall too. 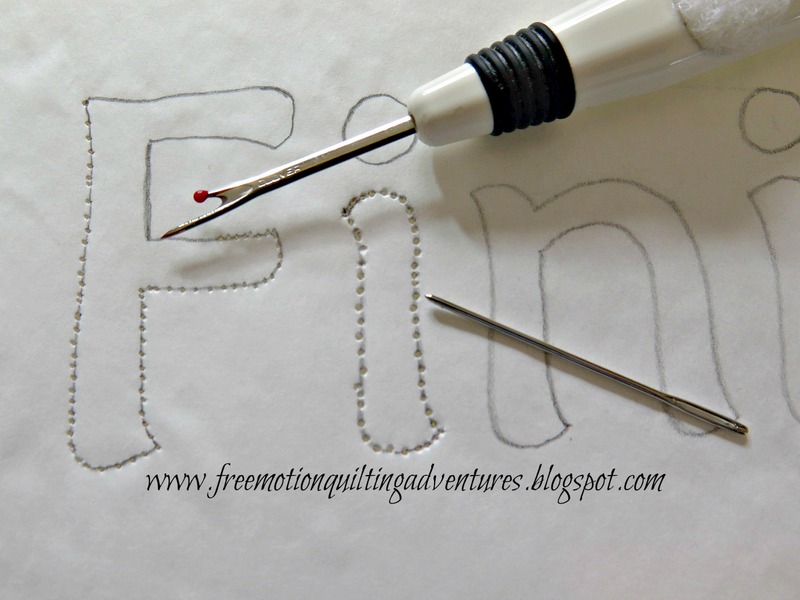 If you've stuck with me this long, or scrolled down, I've got some quilting news too. I bought myself a yummy box of Aurifil thread in the 40 weight. I can't wait to try it. I've got another box of 50 weight backordered in a range of basic colors too. My final quilty news comes via the talented and super helpful Patsy Thompson. She's turned me onto another potential source of ruler feet that are supposed to work for nearly all models of domestic sewing machine. They aren't available for sale yet and I'd like to do more checking into them before I give you the website, but it's so encouraging to hear that there are more options for us to do ruler work. Additionally, she says that while she can't get specifics, she's heard that Babylock is working on a ruler toe too. No idea of when it might be available. Now I better get back to my sweet boy and hopefully get some quilting done. Happy New Year! I created this Christmas piece 3 years ago. It's got a flaw that I forgot about. I hung it up at the shop this year and after it hung there for 4 weeks, somebody pointed it out to the owner. Counselor! Darn it. I consider myself a good speller too. Boss man thought it was hilarious. Of course it was one of his brilliant granddaughters who caught it. Anyway, I just wanted to pop in and say, "Happy New Year!" LOL! Well, I am enjoying them but just when you think you've got a good schedule going, it changes.